As a child, I disliked my name. Too many comments about Marilyn Monroe and the dictionary, although not usually in the same breath. I identified with neither. In graduate school I discovered that the lexicographer Noah Webster and I have more in common than our last names. One of my favorite courses was on the history of the German language. I was intrigued by the connections between languages (English cloth is related to German Kleid ‘garment’) and how words change over time – both in terms of their meaning and the words themselves (Old English wefan became Middle English weben became Modern English weave). In the spirit of fun and fascination with language, I offer you some weaving and cloth vocabulary. In putting together this very selective dictionary, I have consulted my hardcover Webster’s dictionary as well as an online version, the Shorter Oxford English Dictionary and the Online Etymology Dictionary. Web: a whole piece of cloth in the process of being woven or after it comes off the loom. A web is also ‘an intricate or interconnecting structure or series of elements’ such as spiderwebs, cobwebs and the World Wide Web. Webster: originally, a female weaver. Similarly, a spinster was originally a woman who spun. -ster was the feminine suffix and –er the masculine suffix. The suffix is now gender neutral, e.g. trickster and gangster. Warp: lengthwise threads on the loom. Unlike the other w- words in my list which all derive from the Old English verb wefan, warp is related to the German verb werfen ‘to throw.’ I find this intriguing because I throw the weft, not the warp. Weft: the horizontal threads that interlace with the warp. I heard that weft was originally the past tense of the verb weave – weave, weft like leave, left. After doing some research, I think it was always a noun and is more accurately compared to the verb-noun pairs thieve, theft or heave, heft. Woof: a synonym for weft. In Middle English, the noun was oof or owf . It later became woof, probably influenced by warp. Nowadays it is used mainly in the expression “the warp and woof” meaning the underlying structure on which something is built, a base or foundation. Loom: an apparatus for weaving cloth. In Old English a loom meant a tool of any kind. Around 1400 it acquired its current weaving-specific meaning. Heirloom: something of value handed down from generation to generation. This noun dates back to the early 15th century. As much as I want this to be an indication of the value of a weaving loom, I suspect it is actually referring to the more general instrument or tool. Shuttle: the device used for passing the weft thread from one side of the cloth to the other. We now have buses, vans, trains, planes that shuttle us back and forth to cities, airports, parking lots and such. Thread: a fine strand of cotton, wool, silk, flax or other fiber spun out to a considerable length and often twisted together with one or more of these strands. Threads run lengthwise and crosswise through woven fabric, and also through stories, arguments, and online forums. So far all of these words pertain directly to weaving. There are also numerous words where the connection with weaving and cloth is less obvious. I will limit myself to three. Text: What the various definitions of text have in common is words, and specifically written words – the main body of a manuscript, the lyrics of a song, a passage of Scripture, not to mention messages sent on cell phones. 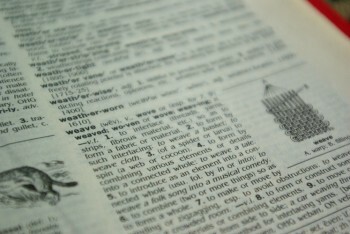 Text is in my dictionary because it comes from the Latin verb texere ‘to weave’ which also gives us texture and textile. I’m not sure how we first got from weaving to written texts, but I do know that many cultures use fabric as a form of text, weaving symbols and stories into the cloth. Invest: When we speak of investing, we usually mean using money, time or energy for something and we hope for some kind of profit or gain. But the verb comes from the Latin verb vestire ‘to clothe, surround’ and in the 16th century, it meant ‘to clothe’ and ‘endow with power, authority, or privilege.’ I love the idea that when we invest in something, we are clothing ourselves. Life span: the duration of existence of an individual. Span is a measurement – the full extent, stretch or reach of something, e.g. wing span, time span. It is also the archaic past tense of the verb spin – spin, span, spun. I like to think of these two ideas coming together in life span. In Greek mythology the three Fates or Moirai were the spinners of the thread of life. Clotho spun the thread, Lachesis measured it out and Atropos cut it. This abridged dictionary only scratches the surface of weaving and textile words in our vocabulary. There are so many more words and expressions — cloaked in fear, moral fiber, threads of time, embroider the truth, a tangled web of ideas, fringe benefits. Cloth is such a part of our lives from waking to sleeping, from birth to death, that it’s only natural that it would be woven into our language. 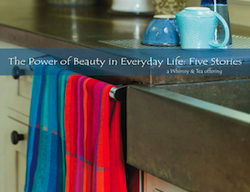 My invitation to you: How does weaving show up in your language? As you pay attention to the weaving and cloth words and phrases you hear or read, I’d love you to share them with me.